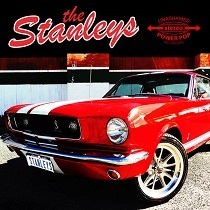 When it comes to The Stanleys’ debut album, I’ve heard comparisons to The Knack, Plimsouls and other late 70’s to early 80’s bands. Listen to any of the 11 irresistibly catchy tracks on the album and you’ll hear something that sounds at least vaguely familiar. Honestly, the influences I heard were very different – more like something out of glam period The Sweet or to a much lesser extent, Raspberries. More than anything though, I saw glimpses of Material Issue. While The Stanleys aren’t a power trio like MI were, they similarly borrow from past iconic sounds and turn it into something completely new. Like the Chinn/Chapman songs of yesteryear, it’s all hook and no filler. And it’s fun as Hell. “Cigarette Glow” and “What Are We Gonna Do?” are three minute start to finish hooks. Listen to “This Time Goodbye” and you’ll hear vocal inflections that may even remind you a little bit of Jim Ellison. Along with Michael Carpenter, Dom Mariani and The On and Ons, The Stanleys are making Australia the place to be for great power pop music. If you’re a fan of short bursts of sing along choruses and catchy melodies that stick like glue, this is your record. This is guitar pop at its finest. Get this one at The Stanleys’ website (digital) or at Kool Kat Musik. PLAY IT LOUD.